This summer, Millard Travel Grant recipients Ms. Vicki Dabrowka and Mr. Frank Donn traveled across the country and across the ocean to bring a new perspective to their classrooms. From all things innovation in Silicon Valley to music that promotes social good in London, both trips inspired our teachers to return energized and ready to share their experiences with our community. 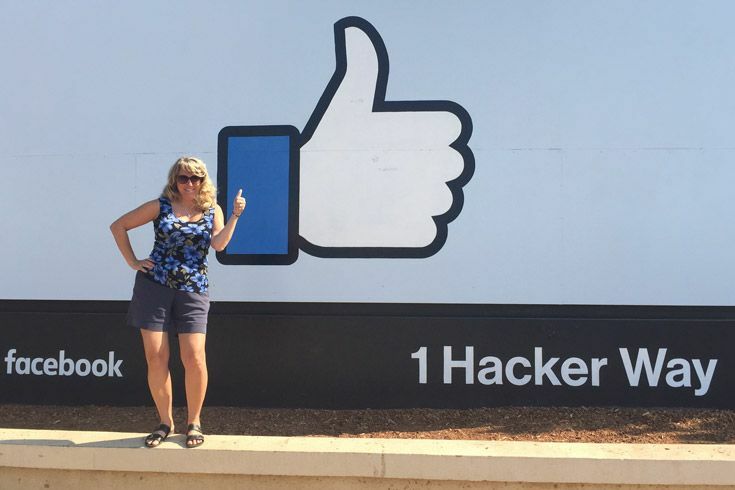 Throughout her trip, Ms. Dabrowka remarked how technology and our attitudes toward it have changed over time. She observed how San Francisco’s rich technological history with the Golden Gate Bridge, cable cars and electric trolleys, has evolved to sustain our revolutionary tech giants of today. While the entire trip was memorable, Ms. Dabrowka notes her visit to Seesaw as a particular highlight. Seesaw is a tool for building, collecting and sharing student digital work that Ms. Dabrowka introduced to Severn two years ago. 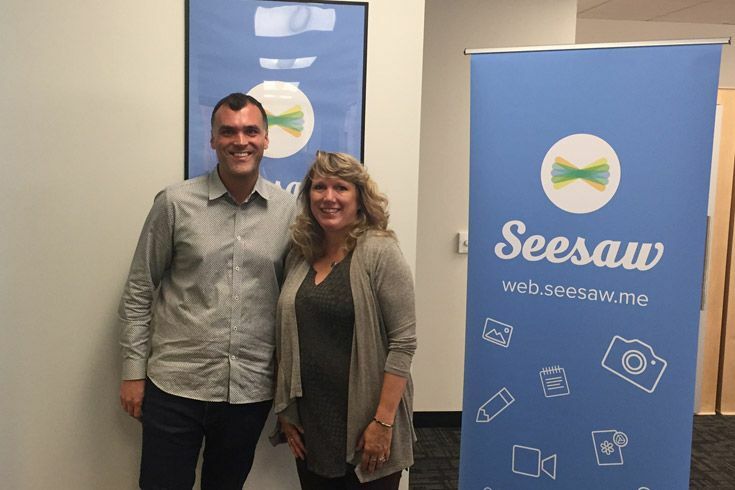 During her visit to Seesaw, she spoke with co-founder Carl Sjogreen (a student of our very own Headmaster Lagarde at his former school!) about entrepreneurship, leadership, the role of technology in the classroom and more. Ms. Dabrowka keeps our Lower School on the cutting edge of what’s new in educational technology. And the unforgettable memories from her trip now inspire her teaching in the classroom. Whether creating new ways for students to showcase their designs with Seesaw or planning the upcoming 2nd and 3rd-grade virtual field trip to the Computer History Museum, Ms. Dabrowka is bringing that good Silicon Valley tech-spiration home to Chesapeake Campus. 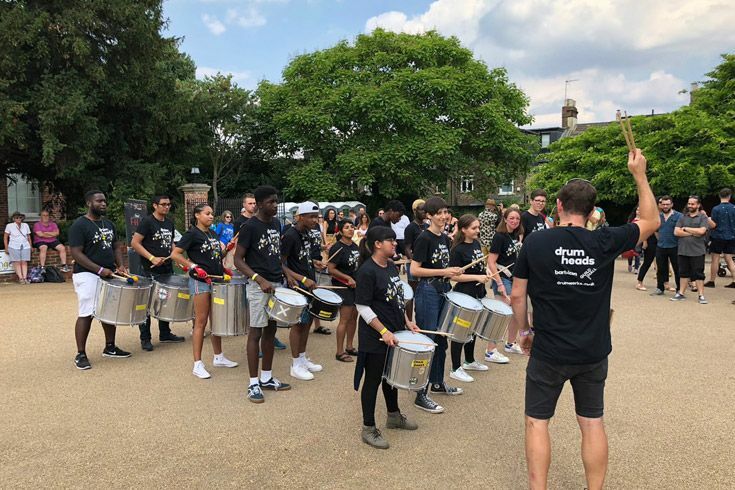 Upper and Lower School Music Teacher and Director of Instrumental Ensembles Mr. Frank Donn spent a week in the Hackney neighborhood of London visiting and playing with Drum Works, a Samba drumming program. Mr. Donn has worked with Drum Works teachers Sam and Ross through Creative Connections, the organization’s US counterpart, for the past eight years on annual music projects for Baltimore City Schools. He was excited to see his friends and colleagues in action abroad. During his stay, Mr. Donn attended Drum Works sessions at two high schools and the Barbican Centre, a world-class performing arts complex, where he played drums with the groups and helped support community outreach classes. Drum Works is an inclusive program for students and adults — any community member can take part. Through music education and performance they seek to teach their members that “positive action, hard work and commitment achieve amazing results everyone can be proud of.” (from the Drum Works website) The energy and synergy of this organization are difficult to capture in words. Even as a visitor for a short period of time, Mr. Donn could see the positive impact this program has on the lives of its members. 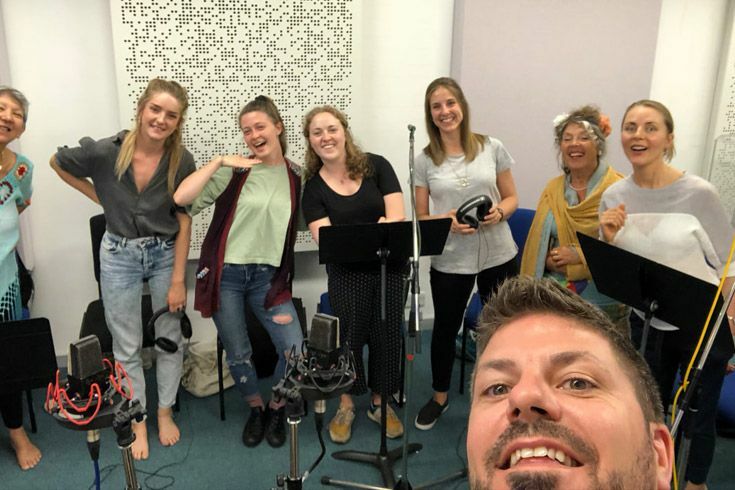 Mr. Donn also visited with the Messengers, a music collective that works with a mixture of students/graduates from the Guildhall School of Music and people who have experienced homelessness and sought support from St. Mungo's homeless charity. Mr. Donn spent the day in the studio with the Messengers and sang with the band during their recording session. As Mr. Donn reflected on his visit, he commented that each of these projects includes people of varying ability levels, from novice to student expert to expert. He was moved to see people from all walks of life create such incredible music together and inspired to bring this point of view back to his students at Severn. Established in 1997, the Millard Faculty Travel Grant provides professional development for the many responsibilities a faculty member might have at Severn: classroom teaching, coaching, advising extracurricular programs and providing leadership in the school. The grants are awarded to either contribute significantly to a faculty member's professional growth in service to Severn or to contribute to the development of curriculum and programs. The Grant has been awarded to over 38 faculty members. Severn School is grateful to Steve Millard '51. 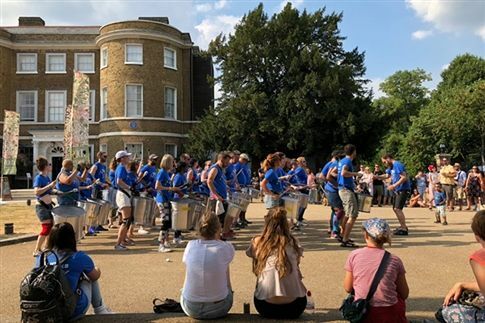 Mr. Donn attended an outdoor Drum Works performance in London.